Are you passionate about design, and want to learn all aspects of visual communication? It begins with design fundamentals. From there, the future graphic designer learns specialized software and the principles, materials and skills to bring a design project to a logical solution of visual communication. This program focuses on developing the creativity and software skills necessary to be competitive in the field of Graphic Design, and students leave with a portfolio of work upon graduation. Using state-of-the-art digital technology, students participate in activities like the State Computer Fair and other competitions that give students the opportunity to apply these principles to a variety of design challenges. 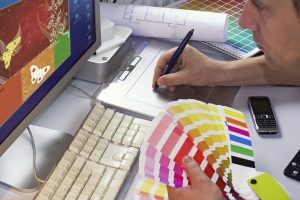 Course coverage includes visual design concepts, color theory, drawing, typography, print production, advertising, corporate design, publications design, packaging design, website design and photography. Students in this program can obtain Adobe Certified Associate Certification in Illustrator, inDesign and Photoshop.